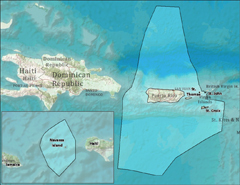 The Caribbean Regional Association for Coastal Ocean Observing (CARICOOS) is the regional association for the coastal and ocean observing system that is being developed for Puerto Rico and the U.S. Virgin Islands. Initial implementation of the Caribbean Integrated Coastal Ocean Observing System (CARICOOS) is focused on meeting identified stakeholder needs for improved real time data products and forecasts of coastal weather (winds), currents, waves, water quality and hurricane-driven inundation for the U.S. Caribbean Exclusive Economic Zone (EEZ). Disseminating data and products to agencies and stakeholders to ensure a user-responsive, operational regional observing system. Implementation of an operational oceanography program using glider technology to improve understanding of upper water column heat content and biological productivity of Caribbean waters. CARICOOS also provides a data portal that brings together coastal ocean data including wind, waves, tides, ocean color, and currents. It also provides access to forecasts from a variety of sources including satellites, ocean instruments and numerical models to give the user an integrated view of past, present and forecasted ocean conditions in the US Caribbean region.